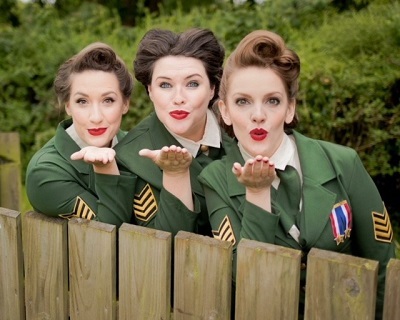 With summer in full ‘swing’ what better time to get your toes tapping, your sweetheart swaying, your Jitterbug jiving and Lindy Hop your way to the Balor as Andrews Sisters inspired trio Swingtime Starlets transport you through the eras with their exceptional voices, slick harmonies, red lips and vintage style! Renditions of the 40’s American Big Band and Wartime Anthems, Retro Pop classics of the 50’s and 60’s and the records that defined The Hollywood Hey Day will put a swing in your step for a Summer Night of musical magic! So dust off those dancing shoes, set the victory rolls and straighten those stocking seams – after a string of hugely successful sold out shows in the North The Swingtime Starlets come to Donegal for the very first time.